Vintage One: 20 years of Mtn Bike passion and counting. : Lift that bale...tote that barge. Lift that bale...tote that barge. Remember when we used to plan on carrying our bikes on pretty much every ride? Or certainly push them? This was back in the mid to late 80s and the trails were often less traveled. 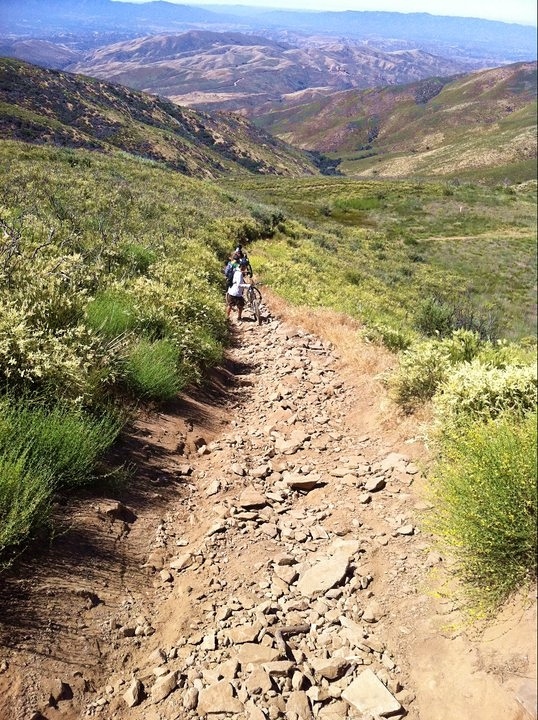 Plus, we were able to go places as mtn bikers that are closed to us now and many of those back country areas were just too steep to ride up or down. In some ways, it also reflected the tech level of bikes at the time. Brakes, tires, suspension, etc, have all evolved to let us ride where used to carry. So you pushed. And, you carried. No biggie. Part of the deal. There was even a name for it: 'Hike-a-Bike'. We had padded straps (portage straps, they were called) that bridged the nose of the saddle and the top tube and provided a somewhat comfortable place to cradle your scoot on hike-a-bikes. On high end bikes like Ritcheys, there were even braze-ons for those straps. 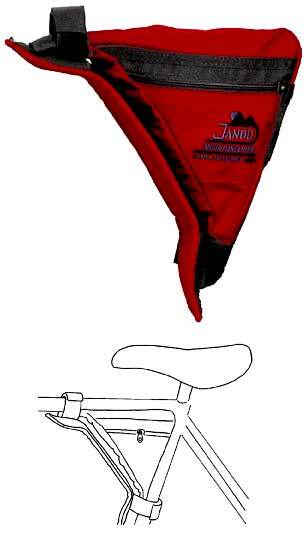 JAAND made (and still does make) a storage bag that sat in the corner of the TT/ST and gave you a carry spot and tool options. Most frame shapes won't even accommodate those now. But that is OK, because we don't push or carry much anymore. At least, not around here. And that is too bad. The act of pushing/portaging typically means that you are on a bit of an adventure. It could mean that you are so dead tired that it is your only option, but that is another thing altogether. However, the times you need to get off the bike and move ahead anyway will bring you to places that most mtn bikers will not go. 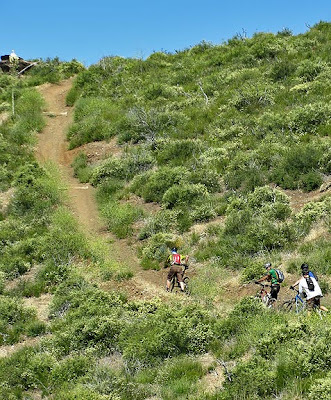 Too steep, too remote, too hard. We actually pushed/portaged the other day on a ride and it was interesting to see the response of the riders. Some grimaced, some smiled. Some questioned the entire process and others just pushed, accepting the deal. It is what it is...whatta'ya gonna' do? Push and carry. I cut my teeth on this type of ride experience. My mentor was an adventurer and we just crossed off every line on the map on and off of our bikes. A 1000' portage was just another day out on the bikes. We got tough and we saw places that no one else we knew ever wanted to go on bikes. I don't do that much anymore, but the other day reminded me that it is something to be dealt with, and, if not enjoyed, at least accepted as part of the experience. We are, after all, mountain bikers and mountains cannot always be ridden on, but should still be traveled. Still, riding or walking, you do get to see what is over that next hill. That reward usually erases any grousing that came before! If Less is More, is More, More?